This column was originally posted in The Petaluma Argus-Courier and on its website. The Petaluma Leghorns continued another summer of baseball excellence, with the same winning formula that head coach Casey Gilroy has had for the last 14 years. This was a classic Leghorns team. They had deep hitting and pitching, but the fight is what counted the most. 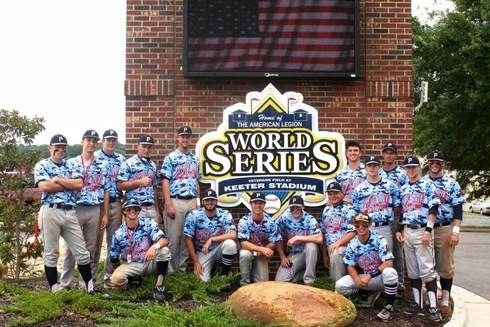 They lost the first game against Yolo in the Area Tournament and came back to beat them twice for the championship, and lost the first game of the World Series only to come back and make the championship game. Last summer, a group of 12 and 13 year olds took Petaluma by storm, becoming the most successful Little League All-Star team in the town’s history. This go around a group of men, not boys, proved the big diamond had just as much excitement, and they too found their way onto ESPN. Gilroy is a Petaluma legend. People still talk about his Little League home runs and each story has the ball traveling further, but there is no doubt the legends are true. He starred in baseball, basketball and football at Petaluma High School, where he led the 1977 Trojans football team as their quarterback to a perfect 12-0 record and the North Coast Section title. After high school, he played baseball at San Francisco State University. But all the legends and the glory are irrelevant when speaking to Gilroy. After the Leghorns won the California State Championships in Yountville, the team went to McNear’s for a celebration lunch. I wanted to ask some questions about their huge win and the first answer I received was one that most coaches wouldn’t say, but many would expect if they knew Casey. “This is for the past, present and future Leghorns,” Gilroy said. The Leghorns are a family, or a baseball fraternity of their own, without the sweet bro tanks, polos or fake Ray Bans. Just look at the coaching staff. Aside from Gilroy, Paul Sequeira and Spencer Finkbohner helped coach the Leghorns. Sequeira has been part of the Leghorns coaching staff for years on both the senior and junior level team. His sons, Anthony and PJ, both played for the Leghorns, as well as Petaluma High School and Santa Rosa Junior College. PJ played two seasons at Oral Roberts University where he was First-Team All-Summit League as a junior and Summit League All-Tournament team and All-Norman Regional team as a senior. Anthony is off to play at Oral Roberts this year after spending two years at SRJC. At the State Championships final game in Youtville, the crowd was a Leghorns reunion. There were former players: Ian Williams, Robby White, both Sequieras, Chris Nadale, Stephen McElroy and Patrick Hodges. Also in attendance was Ron Morris, whose distributing company helps fund the Leghorns; his son Jason, an ex-Leghorn; his wife Bridgid, and Mark and Ramona Nizibian. Always there, too, was Rod Moore, who finances and supports the Leghorns. There might be no Leghorns baseball without Rod. Look at the crowd of games, at McNears after winning state and coming home from the American Legion World Series, at their Facebook page, and the following they received from fans reading my game reports in the newspaper, and it’s clear how much the Leghorns represent Petaluma. The deepest part of the Leghorn family is Casey’s mother, Butch. She is always at the games wearing a Leghorns’ shirt, smiling and shouting for her favorite team. Butch even made the the trip to North Carolina. Expect a warm hello and a hug when you see Mrs. Gilroy. Casey also makes it clear to all his players at the annual Father’s Day Tournament in Chico to tell their fathers that they love him and Casey dedicates the tournament to his late father, Hal. For myself, covering the Leghorns this summer was a gratifying experience as a former Leghorn and fan. Furthermore, watching this team from their first game against the Santa Rosa Rebels to the last one against Brooklawn, N.J., was like looking through a time machine. There were four players — Blake Patrick, Brandon Hagerla, Dom Deville and Scott Hilbert — from my high school, seven players — Anthony Bender, Chase Stafford, Dom Garihan, Charlie Parnow, Nick Marks, RJ Busse and Weston Bryan — from my old rival Casa Grande, and four players — Busse, Bryan, Hagerla and Stafford — who are already Santa Rosa Junior College Bear Cubs, where I played my first two years of college baseball. I even once lost to Hilbert in Madden the summer going into my sophomore year of high school. Yes, I remember Scott, and I’m still mad. The Leghorns are a family. Besides the Sequeiras, there is the Krist family that had Josh and Chadd playing, with father, Mike, helping coach; the Nadale family had Chris and Jon playing, with father, Marc, coaching; the Hagerla family with Brandon this year and Garrett in the past playing; the Graff family with Devon playing this year and Ben in the past; the Ross family with Andrew and Cameron playing; and even my cousin Dino Cristiani and I both playing. You play summer baseball for the Leghorns to be a better player. When your time is done, you realize that you will always consider yourself a Leghorn. I played three summers for the Leghorns, and some of my best memories were off the field. I know that I will never forget swimming at the Bear Hole in Chico, the many times at Mountain Mike’s Pizza on the road, or Sean Purtell chowing down more food than humanly possible at the Peppermill Resort Hotel in Reno. I wore my blue Leghorns shirt under my gown when I walked at my high school graduation, and I still wear it in my senior year of college. The simple fact is, once you’re a Leghorn, you’re always a Leghorn.